An All-American selection in both 1972 and ’73, Gradishar was chosen by the Broncos in the first round of the 1974 NFL draft (14th overall). Moving into the starting lineup at middle linebacker, he was chosen to the Pro Bowl for the first time in 1975. A smart and overachieving player who was especially effective against the run, Gradishar was a 2nd-team All-AFC selection in ’76 and moved to inside linebacker in 1977 as the Broncos switched to a 3-4 defense. Fueled by the “Orange Crush” defense, Denver won the AFC title and Gradishar was a consensus first-team All-NFL as well as Pro Bowl selection. Broncos went 10-6 to finish first in the AFC West while allowing the fewest passing TDs (9) in the NFL and finishing a close second in fewest points allowed (198). Lost AFC Divisional playoff to Pittsburgh Steelers (33-10). Gradishar received first- and second-team All-NFL honors and was again chosen to the Pro Bowl in 1979. He failed to make the Pro Bowl in ’80, a season in which he was credited with 230 tackles, but was selected in each of the next three years. 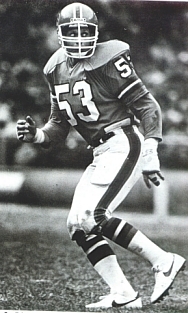 Gradishar played a total of ten seasons, through 1983, and was selected to the Pro Bowl seven times and received at least some All-NFL or AFC honors on eight occasions. He was inducted into the Denver Broncos Ring of Fame in 1989.